A London photography dealer, acting on behalf of a private client, paid $609,600 for a print of Ansel Adams' "Moonrise, Hernandez, New Mexico" earlier this week, setting a record for the print. The previous record for Moonrise was $136,000, set in 2002. The previous auction record for any Ansel Adams photograph was $352,000. Moonrise is one of Adams' most famous prints. It was taken in 1941. It is unknown how many prints of "Moonrise" exist. 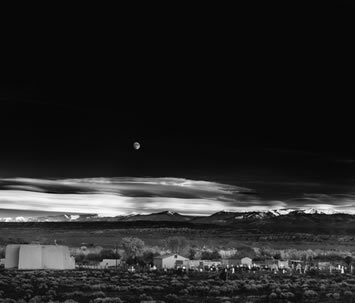 Adams didn't start printing the negative of "Moonrise" until 1948. Each print is different, as Adams interpreted the negative differently each time. Each print of Moonrise gets progressively darker. Two other "Moonrise" prints at the same auction sold for about $33,000 each. Both were printed in the '60s or early '70s with much higher contrast and a darker sky than the 1948 print. The sale shows that photography collecting is about the print — "their provenance, the type of paper, and the artistic interpretation," explained a photography dealer. Not by itself, but it surely can be made to with today's technology. Check out this short film from the people that make Dove soap. 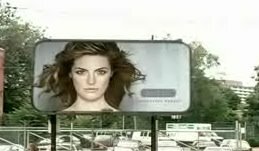 It's an ad for something their touting called The Campaign For Real Beauty, part of the Dove Self-Esteem Fund. I think the point is that advertising gives women a distorted view of what their bodies are "supposed" to look like. The film is an eye-opening look at how a "plain" model is turned into a supermodel through makeup, lighting tricks and Photoshop.